Noah, Noah, What Do You See?, the delightful rhyming board book from the author of Brown Bear, Brown Bear, What Do You See?, will take children on an exciting journey through many favorite Bible stories. Noah, Noah, What Do You See? is a children's board book with the words written in rhythmic form. Each page spread focuses on one Biblical character and asks what they see. For example, "Moses, Moses, what do you see?" "I see the Red Sea parting for me." This book can be used to open doors on teaching little ones about the stories of Jesus' time. After reading each quick tale, parents can supplement the learning by asking questions to their children or going to the Bible and elaborating further on what they just read. A verse directs readers to where the scripture can be found in the Bible. This is a great option for parents who are looking for ways to integrate the Bible into their busy schedules. Noah, Noah, What Do You See? is splendid short reading material for a parent to pour over to their young child, and it's a choice book to read to those with shorter attention spans. One person will win a book copy of Noah, Noah, What Do You See? I admire Mary, the mother of Jesus. She was in situations that were unthinkable then and led her life with dignity. Then she had to feel the pain of losing her son. Jesus and the story of the resurrection are current favorites and being talked about around my house. Tough call. I would say that Jesus is my favorite, followed by John. Jesus is my favorite person from the Bible. Jesus is always a good choice. Noah has always been my favorite. My favorite person in the Bible is Mary! 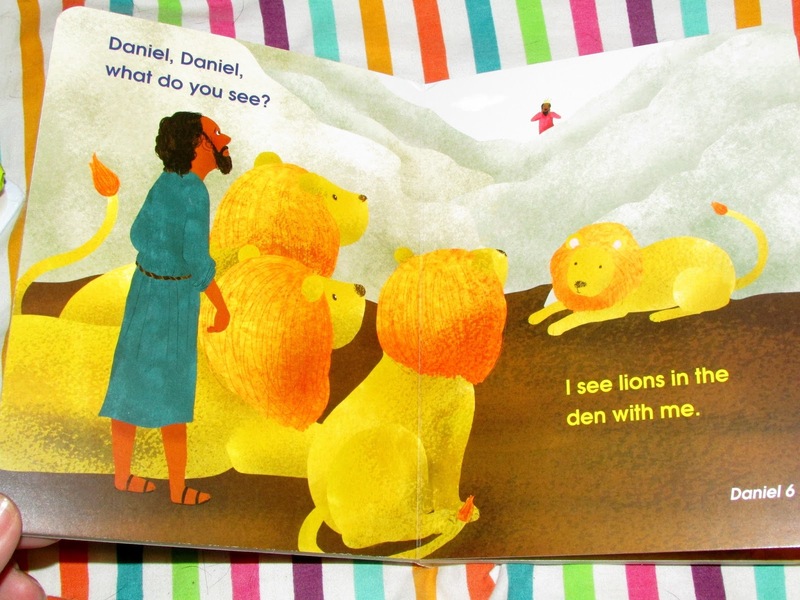 I've always liked Daniel from Daniel in the Lion's Den! I have always liked Moses from the bible. My favorite verse is Psalm 23. I like the story of Noah and his ark. The story of Abraham and Isaac is one of my favorites. I love the creation story, so amazing if we just really think about it. My favorite has always been Noah, what with building the ark & then getting two of every animal inside has always been fascinating. I love the stories of the women of the Bible. They can be so obscure yet so poignant. My favorite character in the Bible is of course Jesus. My favorite part of the Bible is his forgiveness of those who crucified him. When he was hanging on the cross and he told his father to forgive them for they know not what they do. Shows me that if he can forgive those who have come against him in such a big way--I can forgive the minor things people do to me. My nephew's name is Noah. So, of course, its this one! Jesus is my favorite person from the Bible of course.. The smallest verse in the Bible....."Jesus Wept". My favorite verse is found in Psalms. Be still and know that I am God. Jesus is my favorite person of the Bible. Thanks! Moses is my favorite person from the Bible.